All Web addresses mentioned were functional as of 9-11-15. From the Cumberland Gap to the Atlantic Ocean, this is Virginia Water Radio for the week of September 14, 2015. This week, we feature a fast- and far-flying mystery sound. Have a listen for about 15 seconds, and see if you can guess what small but energetic bird makes these sounds. And here’s a hint: in this case, just hum if you DO know the words. If you guessed a hummingbird, you’re right! 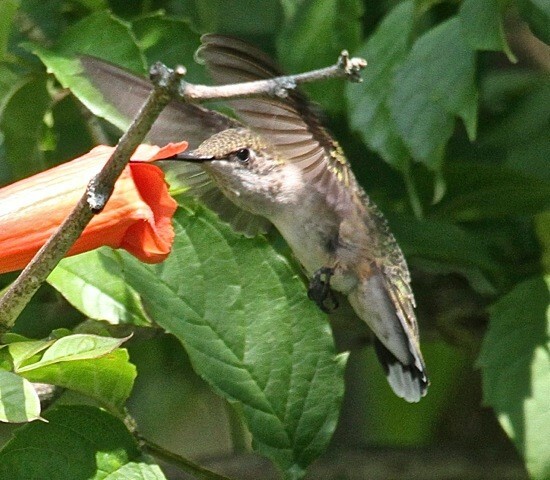 Those were calls and wingbeat sounds from the Ruby-throated Hummingbird, the only hummingbird species—out of about 15 species in North America—that breeds in eastern North America and is commonly found in Virginia. Hummingbirds get their name from their rapid up-and-down wing beats—over 50 per second—that produce a humming or buzzing sound and enable the birds to hover and to fly in quick darts forward and backward. Hummingbirds are the smallest North American birds; adult Ruby-throats, for example, are about three inches long and weigh about three grams, or about one-tenth of an ounce. Despite this small size, twice every year many Ruby-throats take on some really BIG water: about 500 miles across the Gulf of Mexico during spring and fall migrations, with some birds making the crossing in one flight. 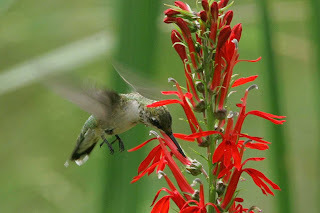 Ruby-throats feed on flower nectar, insects, and sometimes tree sap, and they may double their body mass with energy-rich fats prior to their long over-water migrations. Gram for gram, Ruby-throats and other hummingbirds are some of nature's most efficient flying powerhouses. Thanks to Lang Elliott for permission to use this week’s sounds, from the Stokes Field Guide to Bird Songs. 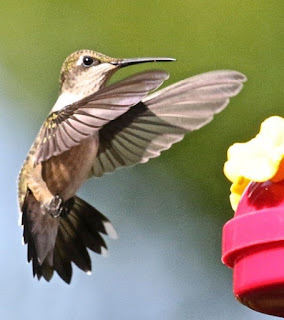 And we close with a few seconds of another hummingbird recording, this time from the U.S. Fish and Wildlife Service. The first sounds of the Ruby-throated Hummingbird were taken from the Stokes Field Guide to Bird Songs—Eastern Region CD set, by Lang Elliott with Donald and Lillian Stokes (Time Warner Audio Books, copyright 1997), used with permission of Lang Elliott, whose work is available online at http://www.langelliott.com/ and the “Music of Nature” Web site, http://www.musicofnature.org/. The closing hummingbird sounds were taken from the U.S. Fish and Wildlife National Digital Library (http://digitalmedia.fws.gov/cdm/), accessed at http://digitalmedia.fws.gov/cdm/singleitem/collection/audio/id/33/rec/1. 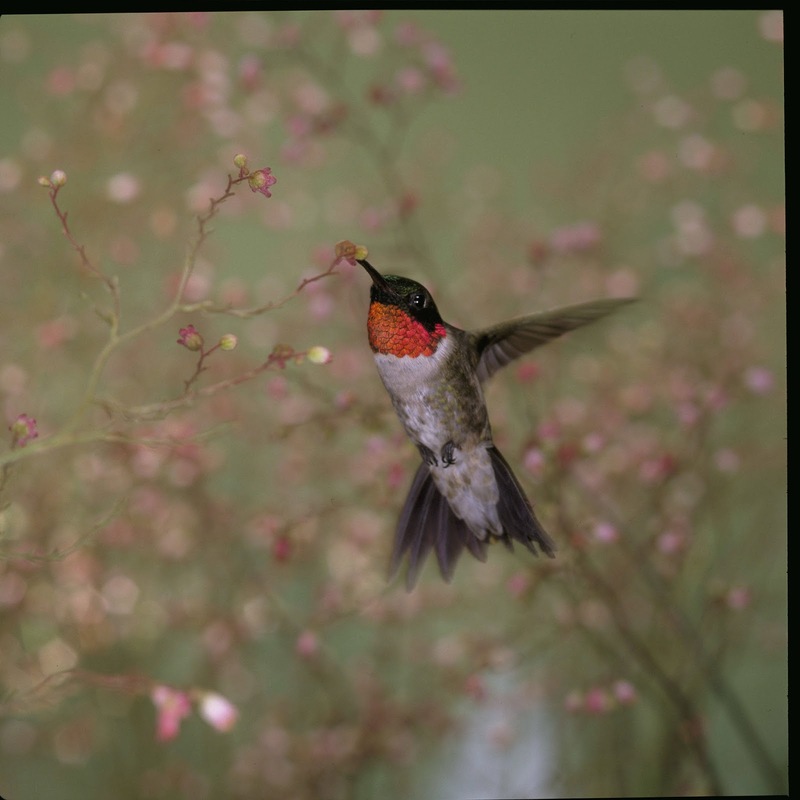 Ruby-throated hummingbird showing male’s bright red throat (upper photo) and individual feeding on Cardinal Flower (lower photo). Photos made available for public use by the U.S. Fish and Wildlife Service National Digital Library, accessed online at http://digitalmedia.fws.gov. Ruby-throated Hummingbird feeding on Trumpet Creeper flower (upper photo) and at a commercial feeder (lower photo). Photos by Robert Abraham of Christiansburg, Va., used with permission. One other species, the Rufous Hummingbird, has been seen occasionally in some Virginia counties, according to the Virginia Department of Game and Inland Fisheries (VDGIF) (see “Fish and Wildlife Information Service” Web site, taxonomy chapter for Rufous Hummingbird, online at http://vafwis.org/fwis/booklet.html?&bova=040219&Menu=_.Taxonomy&version=16689). Bjorn Carey, “Hummingbirds vs. helicopters: Stanford engineers compare flight dynamics,” Stanford [University] News, July 30, 2014, online at http://news.stanford.edu/news/2014/july/birds-versus-bots-073014.html. Cornell University Lab of Ornithology, “All About Birds,” online at http://www.allaboutbirds.org. Cornell University Lab of Ornithology and American Ornithologists’ Union, “Birds of North America Online,” online at http://bna.birds.cornell.edu/bna (subscription required). Chandler S. Robbins et al., A Guide to Field Identification of Birds of North America, St. Martin’s Press, New York, 2001. Virginia Department of Game and Inland (VDGIF)/Fish and Wildlife Information Service, “Ruby-throated Hummingbird,” online at http://vafwis.org/fwis/booklet.html?&bova=040218&Menu=_.Taxonomy&version=16689. Joel C. Welty, The Life of Birds [on fat stores for migration, p. 485; large keel and up/down strokes for hovering, p. 62]. Carol Heiser, “Hummingbird ‘Tidbits,’ Virginia Department of Game and Inland Fisheries, online at http://www.dgif.virginia.gov/habitat/hummingbirds.asp. The Hummingbird Society, non-profit organization headquartered in Arizona, online at http://www.hummingbirdsociety.org/index.php. National Geographic Society, “Hummingbirds,” 2 min./10 sec. video, online at http://video.nationalgeographic.com/video/hummingbirds. More episodes on birds are listed in the “Birds” category at the Index link, http://www.virginiawaterradio.org/p/index.html.